Chicken Parmesan Pizza tastes just like the classic Italian dish typically served over pasta, but I'm putting it on pizza dough today! From the fresh breadcrumbs to the homemade tomato sauce, this pizza is layered with fabulous Italian tastes for maximum flavor! 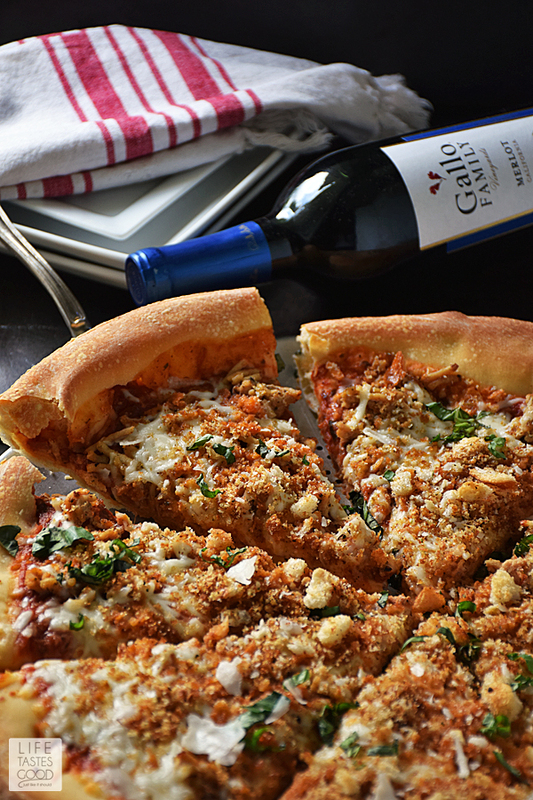 Today, the #SundaySupper Tastemakers are partnering with Gallo Family Vineyards in honor of National Pizza Month! That's right! October is not just for pumpkins! It is National Pizza Month here in the US, and we are sharing our favorite pizza recipes and wine pairings to celebrate this tastiest of months. Be sure to scroll down past my recipe to visit all of the #SundaySupper pizza recipes. I don't know about you, but I don't need a special month for pizza! Pizza is a regular in this household. Back in the BC (before child) years, Don and I had our favorite pizza spot we would visit regularly. You know you're a regular when they greet you by name as soon as you walk in the door! Yep! We love our pizza! 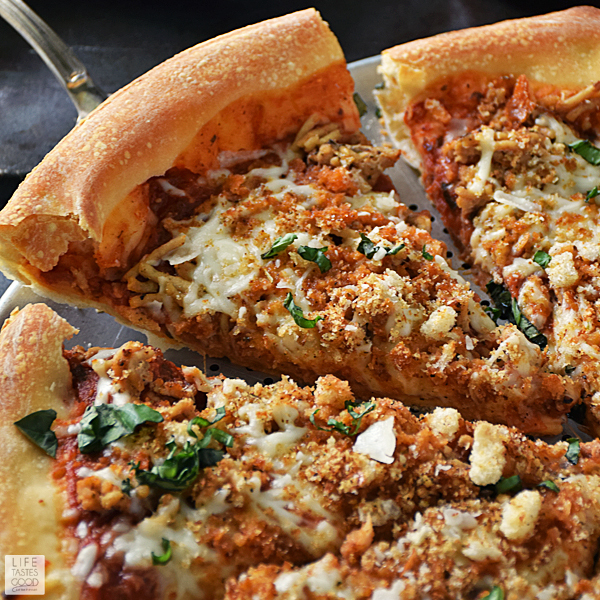 These days we prefer to make it at home and love coming up with exciting new pizza creations like this Chicken Parmesan Pizza inspired by my mom's favorite meal and my Skillet Chicken Parmesan Recipe. Scroll down past my photo tutorial if you prefer the list of ingredients and directions all in one place. This recipe is fairly easy to make, especially if you have a great place to pick up some pizza dough. My local grocery store makes fresh pizza dough and even rolls it for you! While the dough is resting, prepare the breadcrumbs. I use a small piece of a french baguette. I usually grab about a 1/4 of the loaf, which makes more than I need for the pizza, but I freeze the extra for later use. Break the bread into pieces and put it in the bowl of a food processor with 1 teaspoon Italian seasoning, 1/2 teaspoon kosher salt, and 1/4 teaspoon pepper. Pulse until you have crumbs. Toast the crumbs in a skillet over medium heat with 1 tablespoon of olive oil until nicely browned. Remove from skillet and set aside and reserve for topping the pizza. and leave it there for about 4-5 minutes to get a nice sear on the outside. It's so difficult to get a good sear on ground meat, and this is the best way I've found to do it so far. There's all kinds of delicious flavor in that brown y'all!! Once the chicken is nicely browned on the one side, flip it over and add 1/4 cup chopped onions with 1 teaspoon freshly minced garlic, 1 teaspoon Italian seasoning, 1 teaspoon kosher salt, and 1/2 teaspoon pepper. Notice how in this recipe I have you season the breadcrumbs as well as the chicken and the sauce. Instead of just focusing on the sauce, which is usually the star of the show, we are layering the flavors to achieve the best results. 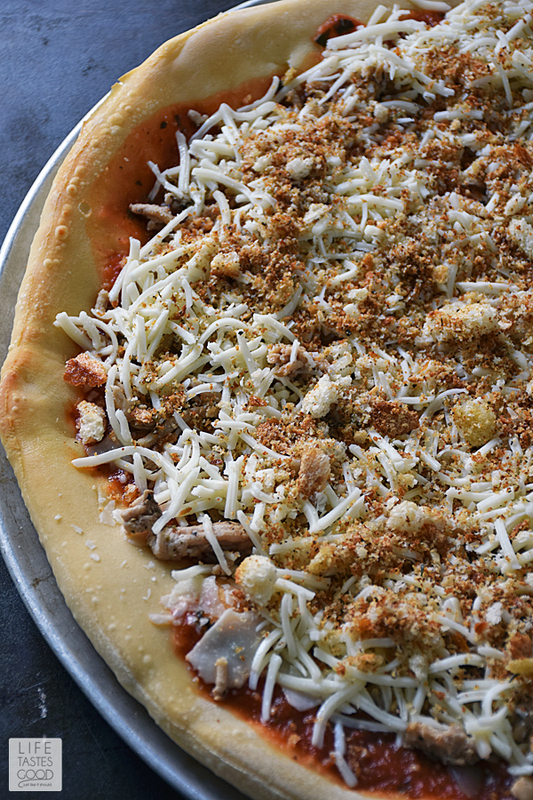 TIP: I make a pound of ground chicken and freeze half of it to make another pizza or to use in chili or some other dish. Then break up the chicken into very small pieces and cook through until no longer pink. Once the chicken is cooked thoroughly, remove it from the skillet and reserve for topping the pizza. To make the sauce, deglaze the pan with 1/4 cup red wine and reduce the heat to medium. 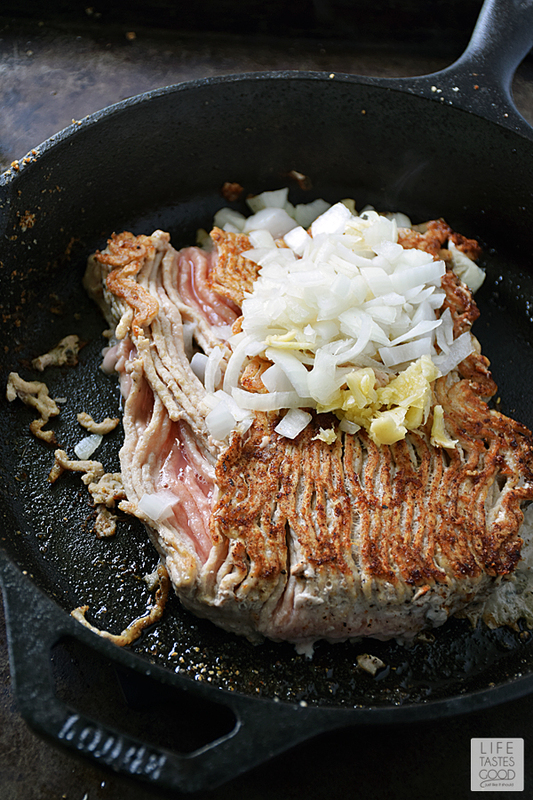 Scrape up any browned bits from the bottom of the pan and add 1 tablespoon diced onions and 1 tablespoon minced garlic. Cook for about 30 seconds and add the diced tomatoes, 2 tablespoons freshly chopped basil, a teaspoon of kosher salt, and 1/2 teaspoon of pepper. Allow the tomatoes to cook down for about 7-10 minutes. 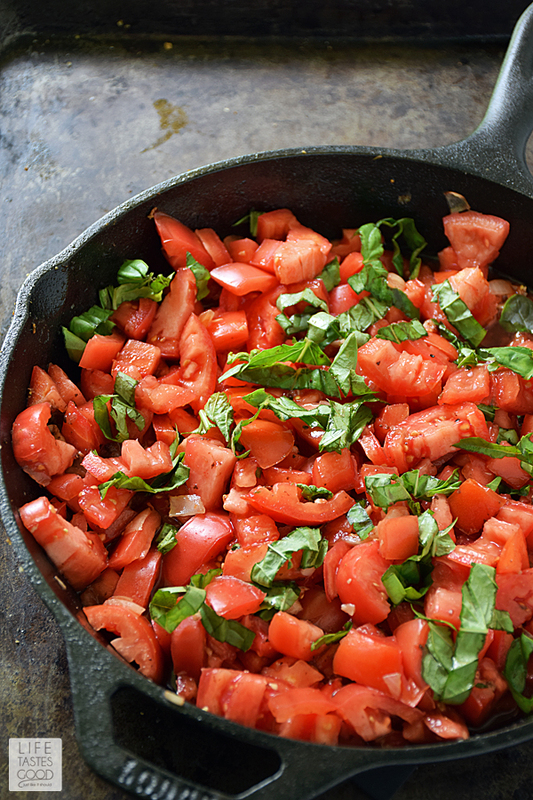 When the tomatoes soften, use the back of a wooden spoon to smush them into sauce. Carefully pour the sauce into a blender and, with a kitchen towel on top of the blender, blend on low until the tomatoes are pulverized into a thick sauce. While the tomatoes are cooking down, prick the pizza dough all over with a fork and brush it with olive oil. Bake in the preheated oven for 10 minutes until just starting to brown. Once the sauce and the dough are ready, start assembling the pizza by pouring most of the sauce on top of the lightly browned crust. Reserve about 1 cup of pizza sauce for serving with the pizza later. If you prefer a white wine, I recommend Gallo's Riesling. It is one of my faves! 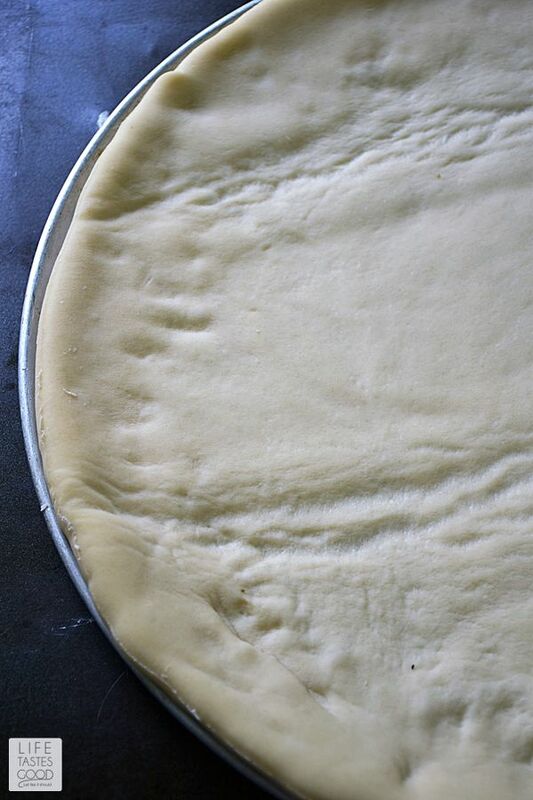 Preheat the oven to 400° F.
Spray a 16" pizza tray with cooking spray and lay pizza dough on the tray. Set aside until ready to use. Click here to see the pizza tray I use. 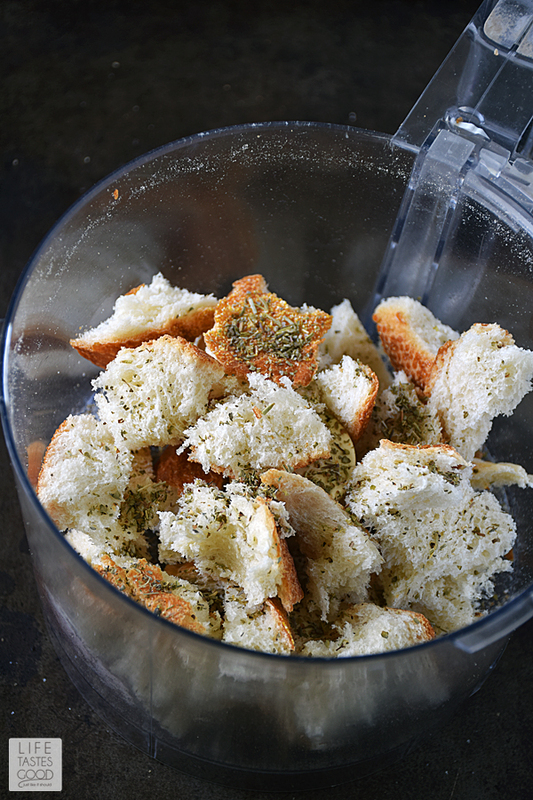 Put bread pieces in the bowl of a food processor with 1 teaspoon Italian seasoning, 1/2 teaspoon kosher salt, and 1/4 teaspoon pepper. Pulse until you have crumbs. 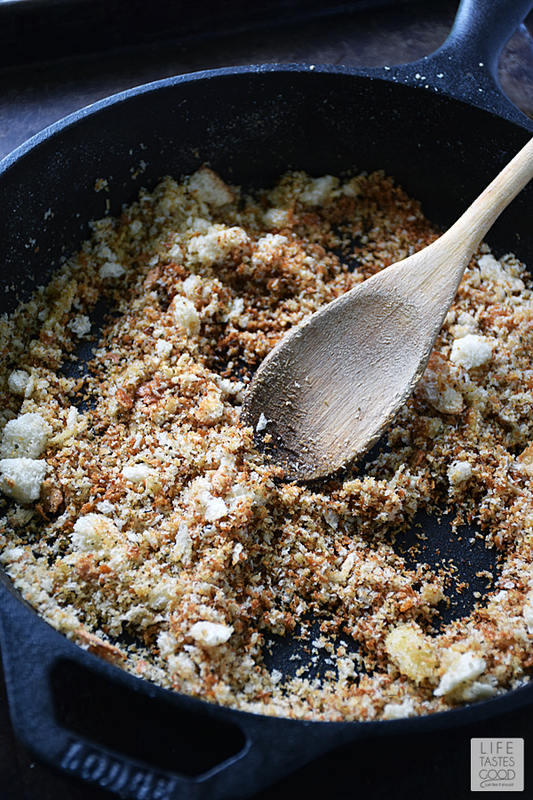 Toast the crumbs in a skillet over medium heat with 1 tablespoon of olive oil until nicely browned. Remove from skillet and set aside and reserve until ready to top the pizza. Up the heat to mid-high and add a tablespoon of olive oil in the same skillet. 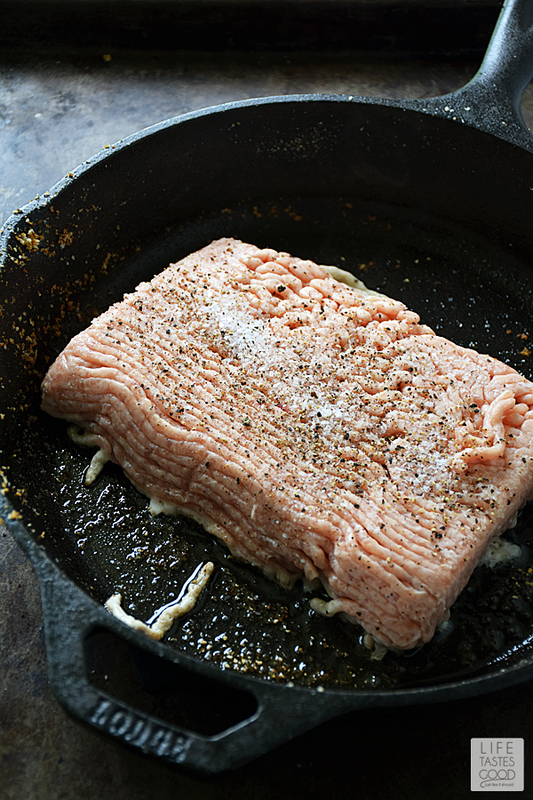 Place the ground chicken in the skillet all in one piece and leave it there for about 4-5 minutes to get a nice sear on the outside. Once the chicken is nicely browned on the one side, flip it over and add 1/4 cup chopped onion with 1 teaspoon freshly minced garlic, 1 teaspoon Italian seasoning, 1 teaspoon kosher salt, and 1/2 teaspoon pepper. break up the chicken into very small pieces and cook through until no longer pink. Once the chicken is cooked thoroughly, remove it from the skillet and reserve for topping the pizza. TIP: I make a pound of ground chicken, but this recipe only uses 1/2 a pound. I freeze the other half to make another pizza or to use in chili or some other dish. To make the sauce, deglaze the pan with 1/4 cup red wine and reduce the heat to medium. 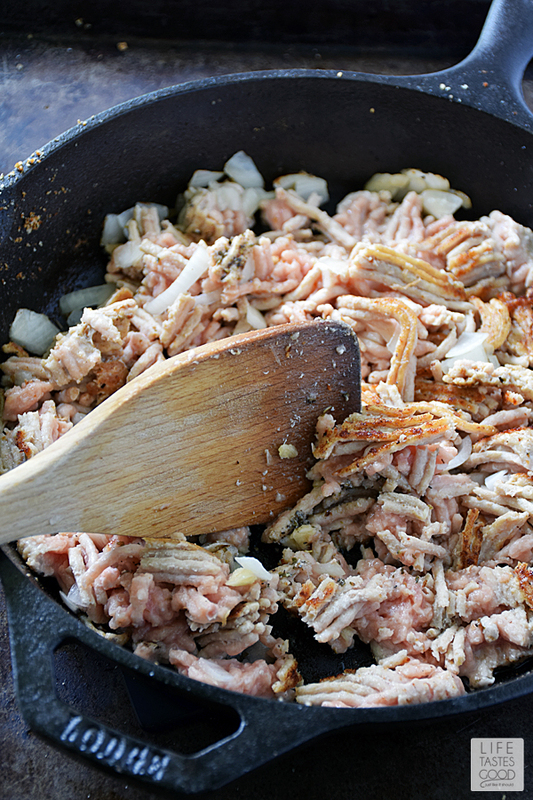 Scrape up any browned bits from the bottom of the pan and add 1 tablespoon diced onion and 1 tablespoon minced garlic. Cook for about 30 seconds and add the diced tomatoes, 2 tablespoons freshly chopped basil, a teaspoon of kosher salt, and 1/2 teaspoon of pepper. Allow the tomatoes to cook down for about 7-10 minutes. 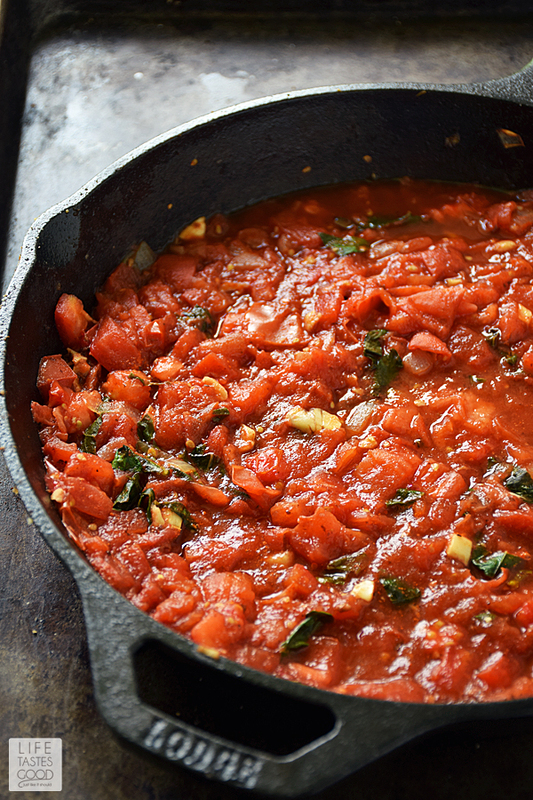 When the tomatoes are softened, use the back of a wooden spoon to smush them into a nice sauce. Top the sauce with 1/4 cup Parmesan cheese, 1/2 of the cooked chicken mixture (freeze the other half for another use), 2 cups mozzarella cheese, and about 1 cup toasted breadcrumbs. Cook the pizza in the preheated oven for 10 minutes until the cheese is melted and the crust is browned to your liking. 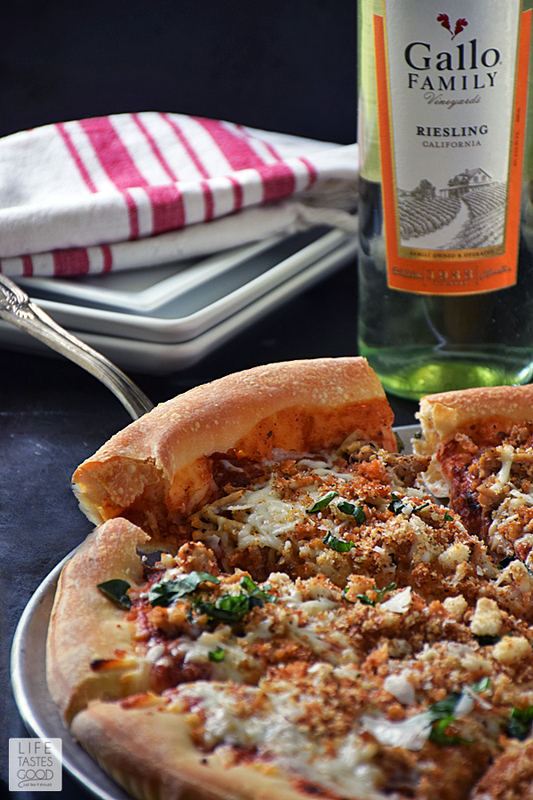 Heat up the reserved sauce to serve with the pizza and enjoy! Also Featured: Simple Tips for Wine Cheese Pairings plus Pizza Recipes #SundaySupper with Gallo Family Vineyards. Need more ideas for celebrating National Pizza Month? 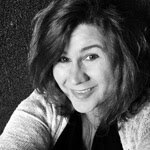 Check out Gallo Family Vineyards’ blog. Join the #SundaySupper conversation on twitter on Sunday! We tweet throughout the day and share recipes from all over the world. Our weekly chat starts at 7 pm ET. Follow the #SundaySupper hashtag and remember to include it in your tweets to join in the chat. To get more great Sunday Supper Recipes, visit our website or check out our Pinterest board. Would you like to join the Sunday Supper Movement? It's easy. You can sign up by clicking here: Sunday Supper Movement. Thanks, DB!! The new book by Recipe Tin Eats is a game changer! Nagi explains things so clearly. It has helped me to learn how to use my manual settings on my camera, as well as understand lighting better. I highly recommend it! Happy Sunday!! I've been waiting for this recipe since I saw your incredible photo on facebook!!! Lucky you with the beautiful store bought pizza dough---the combination of the crust with your toppings looks fabulous! Buffalo Chicken anything is always a favorite of mine! But when ordering pizza out, the "buffalo chicken" is usually breaded, fakey chicken that sounds so unappealing, so I never get it. I can't wait to make this at home instead!! Chicken Pizza is my favorite! 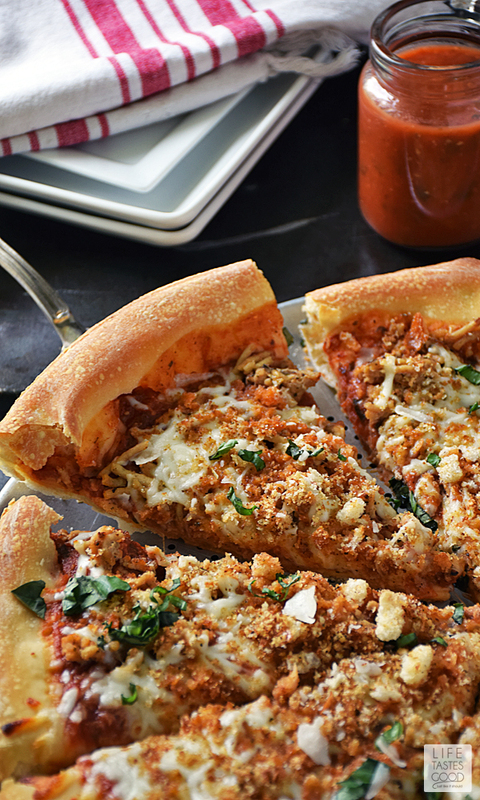 I've never head of chicken parm pizza but that's right up my alley! Each step gets me hungrier and hungrier for this gorgeous pizza!! 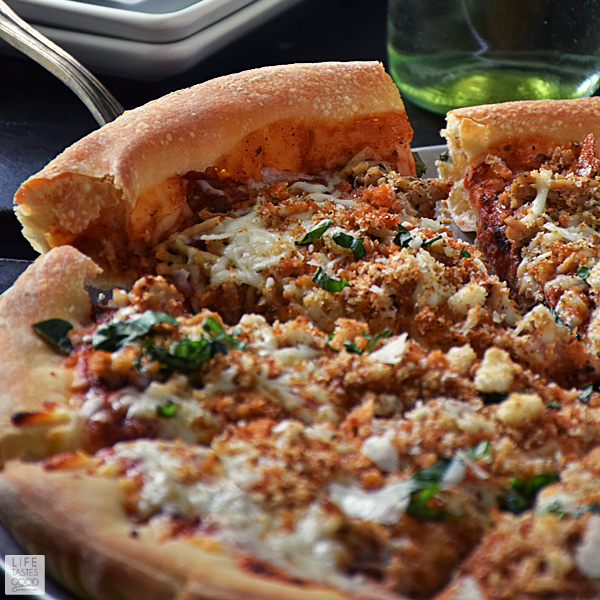 Chicken Parm Pizza - NOW THIS is just above and beyond awesome!! This pizza is to die for! Such beautiful pictures too! There are so many things I love about your pizza - making it in a skillet, all those fabulous toppings and most of all it is unique. You took two Italian favorites and made them better by making them into one.